10-11 May 1941 witnessed the most destructive raid of the London Blitz. Over 500 German bombers were unleashed against the capital, dropping 711 tons of high explosive bombs and 86,000 incendiaries. Hallam, Great Portland and Great Titchfield Streets W1 were among the many St Marylebone and City of Westminster streets hit between 11pm 10 May and 5.30am 11 May. At 12.36am, 11 May, local eyewitnesses reported that a single 1,000lb high explosive bomb had fallen on Great Titchfield Street, killing patrolling female ARP Warden Winnie Dorow from Post D2 and badly damaging several houses. 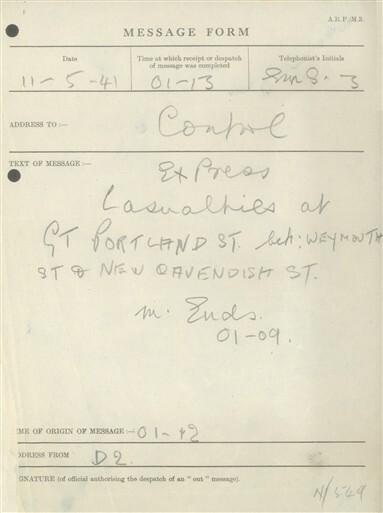 Messages sent from Post D2 to the St Marylebone Report Centre (Marylebone Town Hall) at around 1.13am subsequently noted that Dorow’s civil defence colleagues were assisting ‘walking casualties’ in Great Portland Street, which had been blocked by debris between Weymouth and New Cavendish Streets. At 1.20am, the ARP requested stretcher and Heavy Rescue parties to attend when possible. 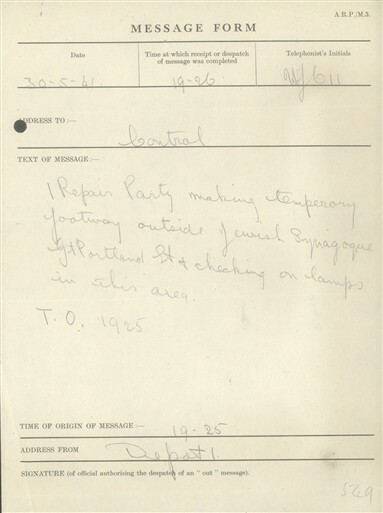 Due to the severity of the raid – after 11pm many incendiary blazes had broken out across the West End – ambulances did not reach the scene until after 1.45am, 11 May. Fire engines did not arrive until 5.10am. By 1.55am, ARP message forms reported that fire was spreading rapidly between New Cavendish and Weymouth Streets and had destroyed parts of a block of flats backing onto Great Portland Street. At the southern end of Hallam Street, a high explosive bomb hit close to Duchess Street, reducing what was left of several Edwardian and inter-war buildings to rubble. This area had already been badly damaged on 16 April when bombs just missed BBC Broadcasting House. 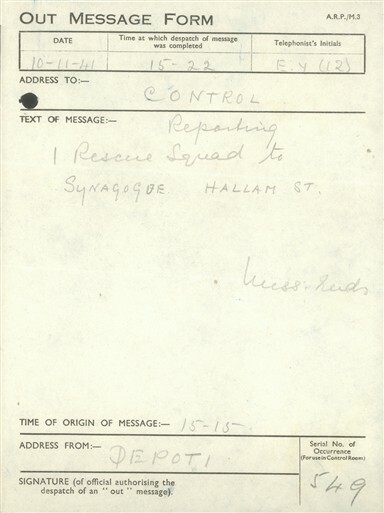 The Central Synagogue, Hallam Street, was also hit after 11pm, 10 May by a single incendiary bomb, which caused a raging fire. The Central – a fine 600-seat Gothic-style Ashkenazi Orthodox Synagogue facing Hallam and Great Portland Streets and consecrated in 1870 – was sheltering local residents displaced by bombing in its basement. According to one account, Warden Ita Ekpenyon of Post D2, St Marylebone ARP - based in The Royal Institute of British Architects (RIBA) headquarters at 66 Portland Place – had just taken charge of dozens of frightened tenants in the basement shelter of Yalding House, a tenement on the western side of Hallam Street, when he noticed a piercing light shining from the Central Synagogue’s roof. An incendiary had fallen on the Central’s north western tower, setting fire to gas pipes in the gallery. One account later described the gas fire as ‘a furnace of blue-white incandescent light’. Realising that the roof was ablaze, Ekpenyon sent an Express Report by messenger back to his ARP commander, Post Warden Stanley Barlow. 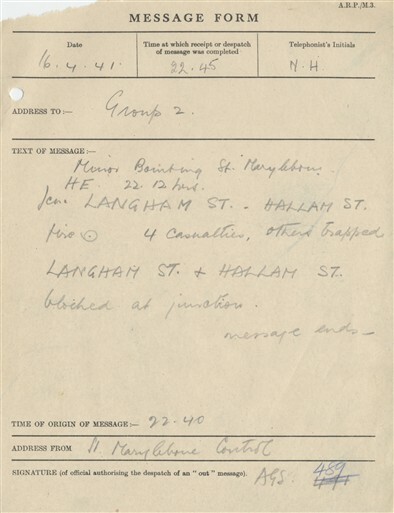 As burning debris fell from the Synagogue into Hallam Street, Barlow ran to the building, entered the basement shelter and carried a woman to safety. From his vantage point in Yalding House, Warden Ekpenyon, a St Marylebone ARP volunteer originally from Nigeria, reportedly sang a stirring Spiritual to calm the residents. As dawn broke on 11 May 1941, the southern end of Hallam Street was revealed as a shambles of broken bricks, smoking embers and partially-demolished houses. 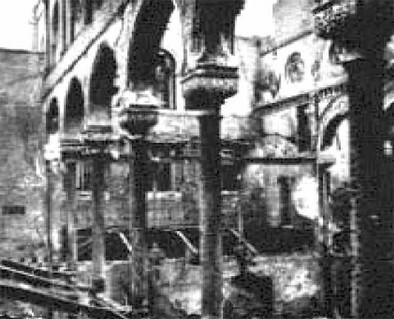 The Central Synagogue had been completely gutted by fire. Local residents noted the severity of the damage. These included veteran American newsman Edward R. Murrow (1908-1965), CBS radio broadcaster. During the Second World War, Murrow, director of the CBS European Bureau in London, lived at Flat 5, Weymouth House, 84-94 Hallam Street. By mid-1941, Ed Murrow was a well-known foreign correspondent in the capital, vividly interpreting Londoners’ experiences in the Blitz in nightly broadcasts to an American audience, at a time when the United States still remained a neutral observer. The clear-up of Hallam and Great Portland Streets began in earnest during the following week, although disruption to the area continued well into November 1941. The normal traffic flow on both streets did not resume until 20 May; local road repairs continued until the end of the month. 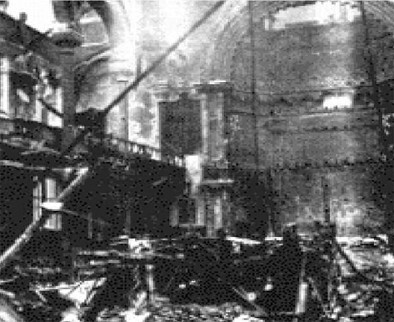 The Central Synagogue remained an unstable structure until June. 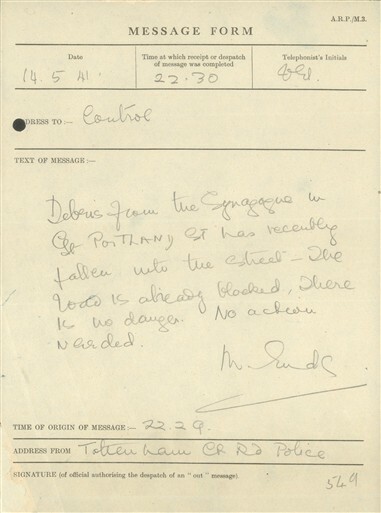 A message to St Marylebone ARP Control for 10.30pm, 14 May, written by the Tottenham Court Road Police, noted that “debris from the Synagogue in Great Portland Street has recently fallen into the street – the road is already blocked. There is no danger”. On 30 May, ARP teams from Post D1 reported temporary footpath repairs were under way outside the Synagogue and that electricians were checking damaged street lighting. Closed for the rest of the war, the Central was fully restored and rebuilt in 1958. ‘had been experimenting (on 10 May 1941) with poison gases of which there were samples on the roof; which however were not affected either by the HE explosion or the subsequent fire and have now been removed to University College Hospital”. 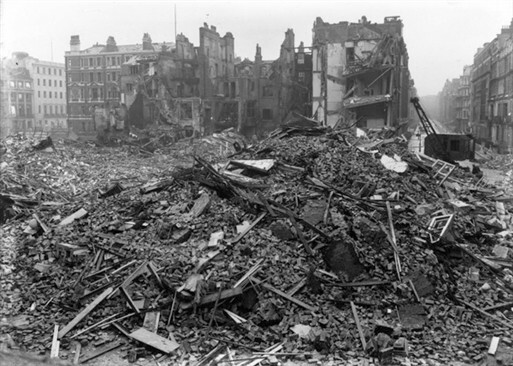 Witness testimony from: The City That Would Not Die, The Bombing of London May 10-11 1941, Richard Collier (1960). This page was added by Ronan Thomas on 02/09/2010.